North Tabor community meetings are generally held on the third Tuesday of the month from 6:30-8:30pm at 4837 NE Couch. Please call 503-928-4655 or check the meeting agenda to confirm meeting time and location. 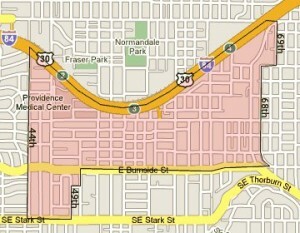 Boundaries of the North Tabor Neighborhood: North Tabor is bounded on the west by 44th Avenue and the Laurelhurst Neighborhood and on the east by 68th and 69th Avenues and the Montavilla Neighborhood. The southern edge of North Tabor is Burnside Street and Mount Tabor neighborhood Neighborhood Association (except in the area between 44th and 49th Avenues where the neighborhood extends south to Stark Street and the Sunnyside Neighborhood). The Banfield Freeway (Interstate 84) forms North Tabor’s northern boundary, separating it from the Hollywood District, Rose City Park, and Madison South neighborhoods. North Tabor was originally considered part of north Mount Tabor, and was predominantly farmland. Development followed with the construction of the Mount Tabor Villa streetcar line, which served our area and the neighborhood that came to be known as Montavilla. The streetcar line, which ran along Glisan from about NE 28th to east of NE 82nd, was originally constructed in 1892, and quickly triggered development, particularly in the areas closest to the streetcar line. In the early 1970′s local residents formed CENTER Neighborhood Association, an acronym for Citizens Engaged Now Toward Ecological Review. The neighborhood association continues to be concerned with maintaining its historical design, comprised of single-family bungalow and cottage homes. 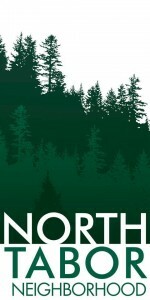 In November of 2008, the neighborhood association voted to change the name of the neighborhood to North Tabor. North Tabor today is made up of a diverse group of world citizens, featuring an unpretentious working-class backbone and a strong creative class influence, evolving alongside up-and-coming developments designed to complement the character and historic aspects of our neighborhood. https://goo.gl/nu4BzO. As far as I know from my research about the Reid family, the house that was Wilbur and Evelyn Reid’s primary residence has never had a formal name. Hi Karen! Thanks for letting us know. I’ve updated the history page. If you have any additional neighborhood history to share, we’d love to post it here!